U.S. President Barack Obama is 3D scanned with Artec Eva to make the first ever 3D presidential portrait. As reported by the White House, the first ever 3D presidential portrait has been created, using Artec Eva to 3D scan President Obama. A behind-the-scenes video detailing how the 3D portraits were made has been published by the White House. Inspired by President Lincoln life masks, made some 150 years ago, the team decided to capture the incumbent U.S. leader with the best technology available on the market. Preparations, which started with a vision document titled “Next Generation 3D Portraiture: A Digital Life Mask of President Obama,” took two years to complete, but it only took the team a little over 7 minutes from the time President Obama entered the room to finish the data capture for the first presidential 3D portrait. Artec Eva was brought into play to make a high-resolution 3D scan of the president's head. The president was asked to sit still for 90 seconds while two 3D digitization professionals circled him with Eva 3D scanners. Those in the room could see the image emerging on the laptops tethered to the scanners. Seventy-two hours later the team delivered a master file of 15 million triangles, which yielded print-ready files for an Obama bust and a life mask, as well as photorealistic 3D models for digital viewing. Printing out the first bust and cooling it down took another 66 hours. The first busts made from the 3D data are on public display at the Smithsonian Castle in Commons Gallery from December 2 until December 31. For further information on the story and the history of the project, see the White House website. 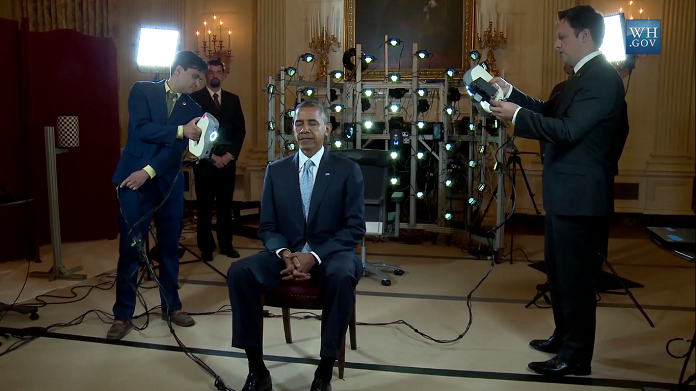 "We are very proud that Artec scanners were used to 3D scan President Obama. With our technology, 3D scanning has never been easier and more accessible. In fact, anyone can now get their 3D portrait done, not only the US President, thanks to our handheld scanners or 3D full body scanner Artec Shapify Booth."